Sunscreen – friend or foe? Go cheap or break the bank? Spring is here! And the NM sun can be rough. I live in the “other” mile high city and being a mile closer to the sun DOES make a difference. We have to take care. But the opinions on sun protection really vary. From SPF 50+ all the time to “NEVER EVER!” What’s a mama to do? I am sure we can all agree we do NOT want our kids’ skin (or our own) to burn! If you’re not sure you want the Copper Boat brand name types of your youth but also can’t afford the organic, super natural type, let’s look at some options. First, I really should just direct you to this post by Katie Kimball at Kitchen Stewardship. 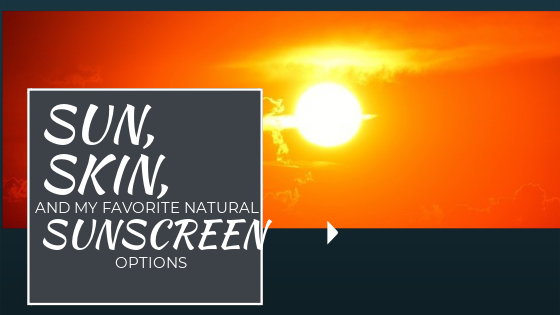 This lady has done her research and provides you with practical advice to help you choose when to use sunscreens and HOW to use them. She offers you an overview of how sunscreens work (they don’t all use the same mechanisms to protect you). 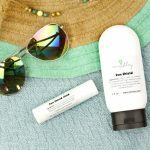 She outlines her evaluation criteria and process and then offers detailed reviews of over 80 mineral sunscreens that her family actually tried! She breaks down each by cost, too. You can get free sunscreen resource guide here, as well. If you’re overwhelmed (it’s a long post!) take a look at her appearance on a news station’s interview where she covers some of the basics. So, with all that info (go ahead – take a look and then come back), I’ll add my few words. First – sun hats. You gotta have ’em here! But as my kids have gotten older it’s been harder to keep hats attached to their heads. So I try to compromise with baseball caps or anything else they might deem acceptable. Anything. I encourage the use of sun protection as I deem prudent and listen to their opinions on different types of product. We found that mineral powder sunscreen was easier to apply to faces of wiggly kids who might dislike the feel of lotion/cream on their faces. Especially girls who might be drawn to make-up like application! I got mine here ages ago. I keep the “poison” on hand for out-of-the-ordinary outings – beach, treeless hiking, being on the water. That’s right – the first day on the beach or on a boat I get out the hard stuff. I do believe that diet does affect your skin’s reaction to the sun. The less PolyUnsaturated Fatty Acids (PUFAs) the better. And many people believe in other natural supplements that might help, including astaxanthin. I recently saw a FB ad for Sundots, a gummy supplement being touted for sun protection. So I’m not the only one! I have a redhead and when she was six months old I had to take her to Hawaii for a family funeral. We spent time on the beach. A lot of time. I kept her hat on and used coconut oil on her bare parts. We did fine! No burns! But my children no longer sit on my hip at all times and I can’t control their hat wearing at every moment. So here are some of the sunscreens we have used with success. I’m starting with Super Salve because I have years of experience with them, their sun products, and their other lines. They are local to me and they use local herbs in many of their formulations. In the future, I’ll share more about some of their non sun products that I use regularly. 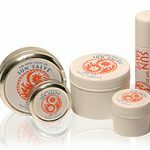 Sun Salve comes in several types of packaging. We like the stick! 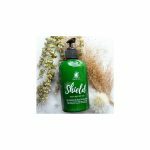 It contains Olive oil, beeswax, organic comfrey leaf oil, African shea butter, jojoba oil, active sunscreen ingredients (5% zinc oxide and 5% Avobenzone), cocoa butter, sweet almond oil, vitamin E oil, and pure essential oils of lemongrass and lavender oil and so is a mild insect repellent. This herbal salve also is great for boo boos and bug bites and has an SPF of 27. Search under Balms and Salves on their website. I keep a stick of this with me always to apply to noses and ears. The Sierra Madre Sun Cream is definitely creamier. I kinda love the smell. 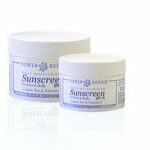 This SPF 30 cream is water resistant and soaks in more than the Sun Salve. CONTAINS: (6% zinc oxide, 5% avobenzone, and 1% titanium dioxide), aqua (deionized water), beeswax (apis melllifera), butryospermum parkii (shea) butter, cocos nucifera (coconut) oil, enzyme lactoperoxidase, glucose oxidase, lecithin, olea euopaea (olive) oil, organic prunus dulcis (almond) flavor, sesamum indicum (sesame) oil, simmondsia chinensis (jojoba) oil, and tocopheryl acetate (vitamin-E). Search under Body Care – Creams on their website. This is the one I prefer to cover limbs, shoulders, and necks. The Daily Moisturizing Sun Cream makes a nice daily face cream with spf protection. SPF 15. CONTAINS: Purified spring water, plant-infused oils of comfrey leaf, green tea & horsetail, olive oil, sesame seed oil, grapeseed oil, organic vegetable emulsifying wax, beeswax, shea butter, cocoa butter, jojoba oil, active sunscreen ingredient (2% zinc oxide, 1% titanium dioxide), pure essential oil of lavandin grosso; glucose oxidase & enzyme lactoperoxidase. Search for this under their Power Repair Line. I set it out in the summer to remind my redhead to use it before any outings to the park. based oils infused with organic herbs. It has natural antioxidants to keep skin healthy and safe. Listed ingredients include organic olive oil, avocado oil, virgin raspberry seed oil, grapeseed oil, organic mango butter, organic comfrey leaf, organic dandelion leaf, organic calendula flowers, and organic beeswax. Take a look for lots of useful reviews. I have a small 1oz container of this. It’s quite moisturizing. I have decided this is good to slip in purse for those “oops, we’ve been out here longer than I planned” moments. I can also use this one as a salve, with its healing oils and herbs. So it’s become an all-in-one handy addition to my purse. You have the option to get it tinted so it doesn’t leave the white mineral residue all over! You can choose the “Tinted with Bronze Mica” option and sparkle! $12.95 – read my post on how you can get this for free. So, there you are, folks. Some lesser known sunscreen options. As with all sunscreens, especially natural ones – you will need to apply and reapply. That’s the real secret to finding a sunscreen that works!